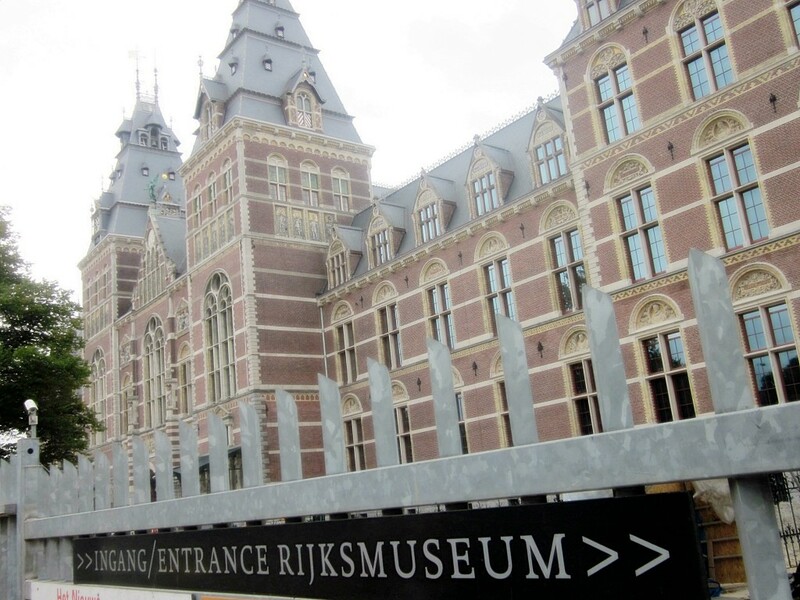 On Day 3 of our trip we visited the State Museum (Rijksmuseum).. The museum is undergoing renovations and, fortunate for us, during this time The Night Watch can be seen in the Philips Wing together with a lot 17th-century masterpieces of the museum. 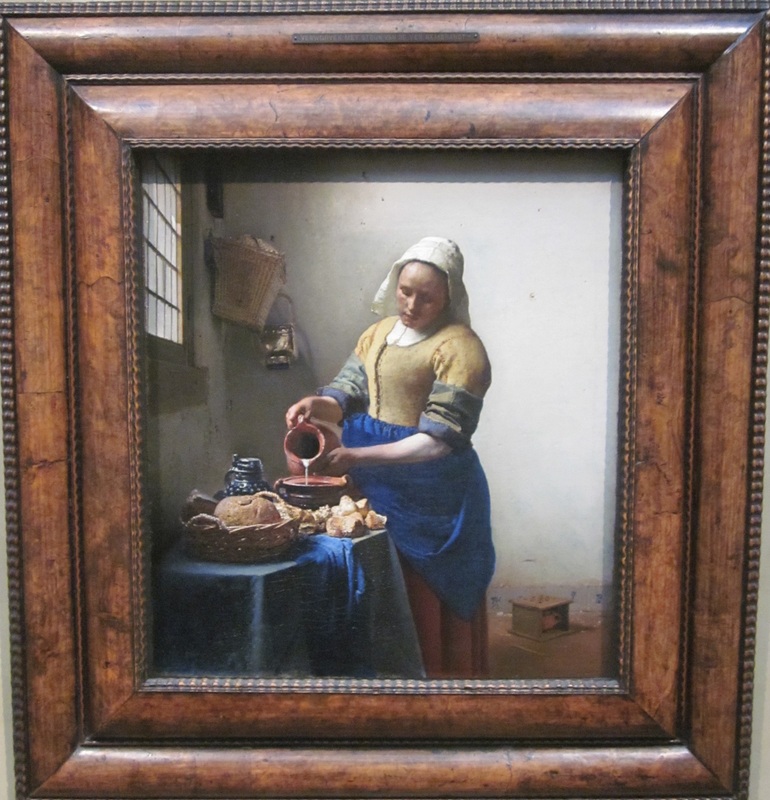 Here is Vermeer’s “Milkmaid” painted around 1660.The picture shows a kitchen or housemaid in a plain room carefully pouring milk into a squat earthenware container (now commonly known as a “Dutch oven“) on a table. Also on the table are various types of bread. She is a young, sturdily built woman wearing a crisp linen cap, a blue apron and work sleeves pushed up from thick forearms. 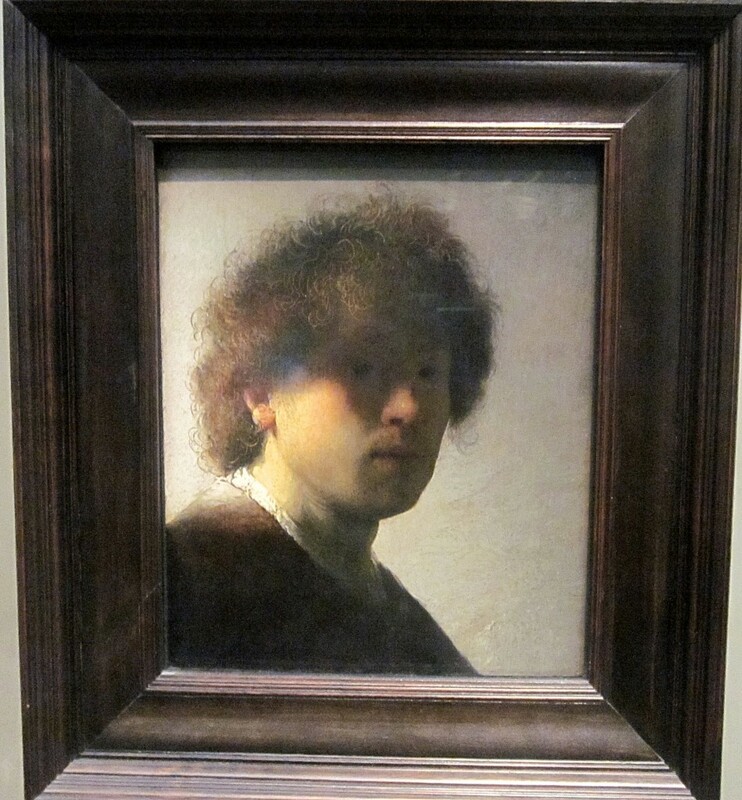 Here is a self portrait of Rembrant Van Rijn pained in 1629 at age 22. It is painted in a Chiaroscuro style. That is an Italian term which literally means ‘light-dark’. In paintings the description refers to clear tonal contrasts which are often used to suggest the volume and modelling of the subjects depicted. This is one of Rembrants most famous paintings: The Militia Company of Captain Frans Banning Cocq. Painted between 1640 and 1642. This picture was called the Nachtwacht by the Dutch because by the 18th century the picture was so dimmed and defaced by time that it was almost indistinguishable and it looked quite like a night scene. After it was cleaned, it was discovered to be a daytime painting of a party of musketeers stepping from a gloomy courtyard into the blinding sunlight. 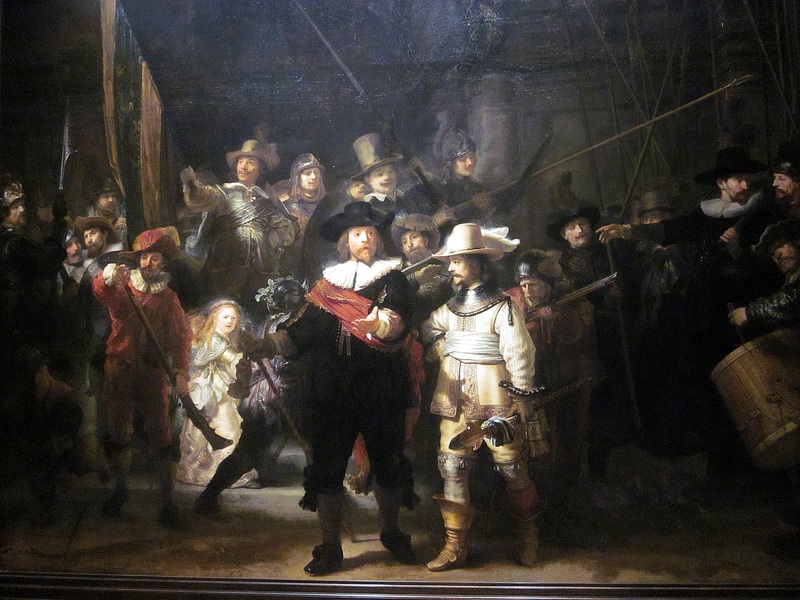 Rembrant showed a militia readying themselves to embark on a mission (what kind of mission, an ordinary patrol or some special event, is a matter of debate. This is a painting by Franz Hals called ” Portrait of a Young Couple“. Franz Hals the Elder (c. 1582 – 1666) was a Dutch Golden Age painter. He is notable for his loose painterly brushwork, and helped introduce this informal lively style of painting into Dutch art. 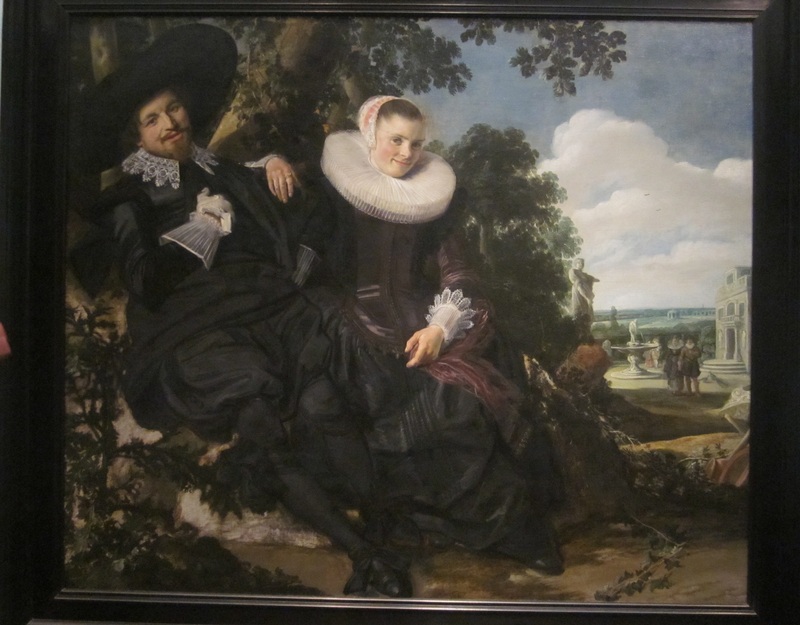 Hals was also instrumental in the evolution of 17th century group portraiture. This is “The Skaters” By Hendrick Avercamp (1585 – 1634, He is the most famous exponent of the winter landscape. He was deaf and dumb. 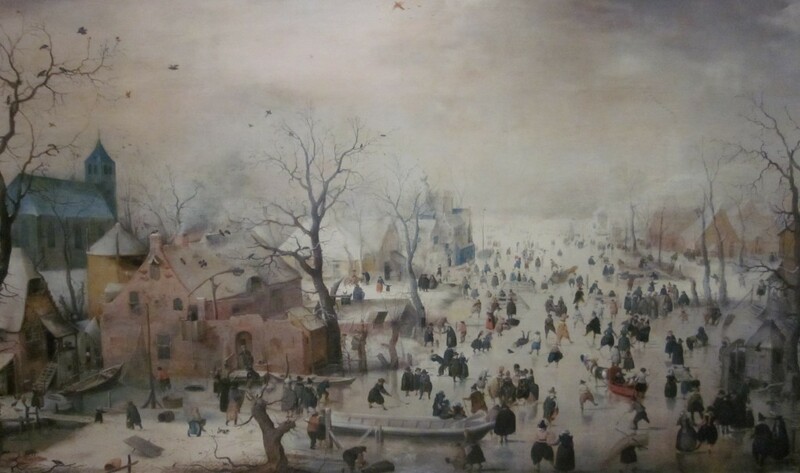 As one of the first landscape painters of the 17th-century Dutch school, His paintings are colorful and lively, with carefully observed skaters, tobogganers, golfers, and pedestrians. If you click on the painting and examine it closely you may find “Waldo”. 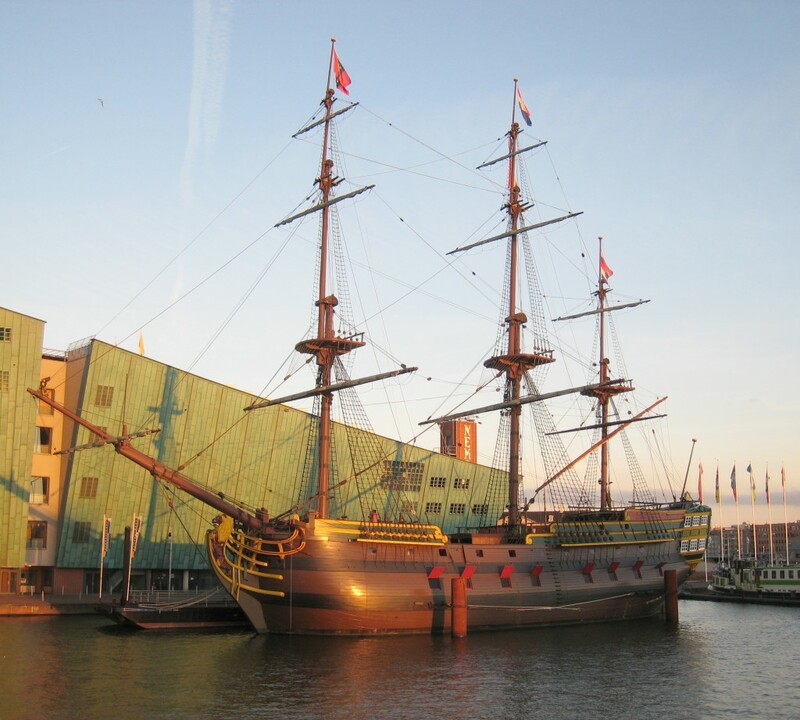 The Amsterdam was an East Indiaman built for transport between the Dutch Republic and the settlements and strongholds of the Dutch East India Company in the East Indies. On an outward voyage these ships carried guns and bricks for the settlements and strongholds, and silver and golden coins to purchase Asian goods. 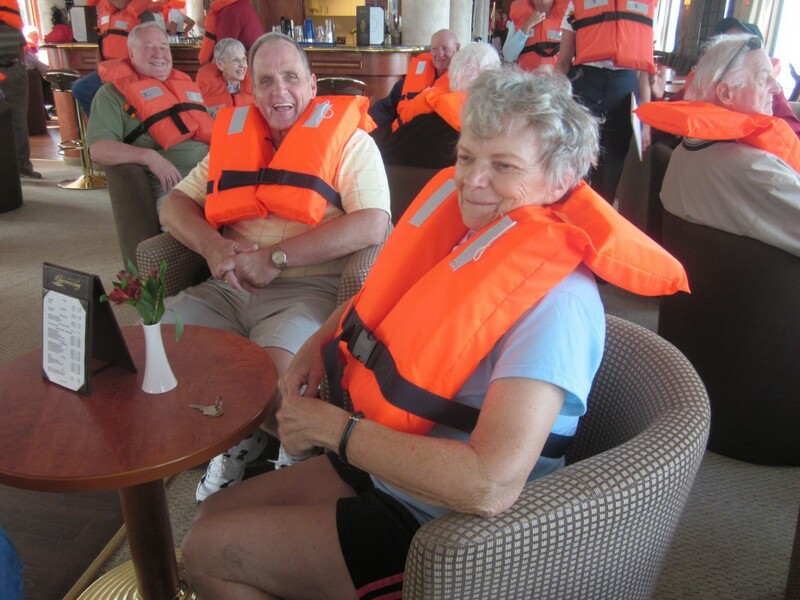 On a return journey the ships carried the goods that were purchased, such as spices, fabrics, and china. In both directions the ships carried victuals, clothes, and tools for the sailors and soldiers on the ship. On an outward voyage of eight months, the ships were populated by around 240 men, and on a return journey by around 70. 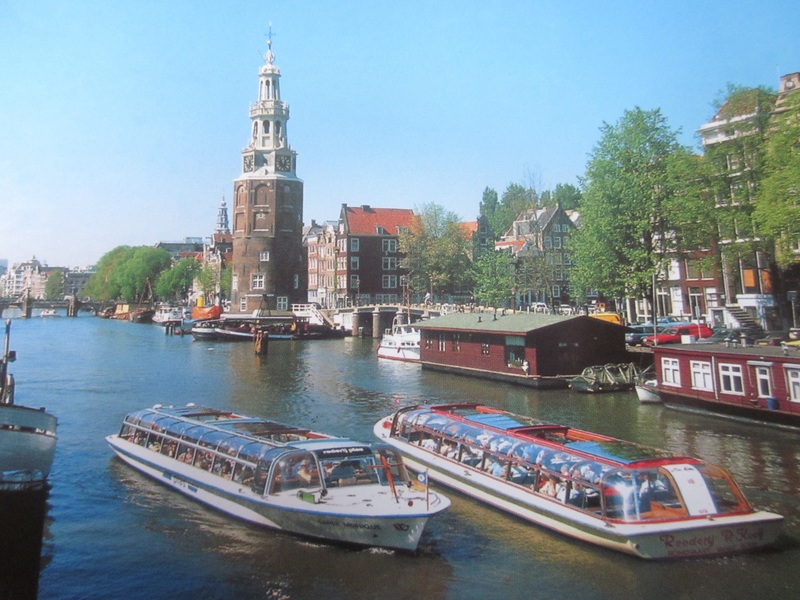 After a while, we got underway and headed down the Rhine Amsterdam Canal headed for the Rhine River. 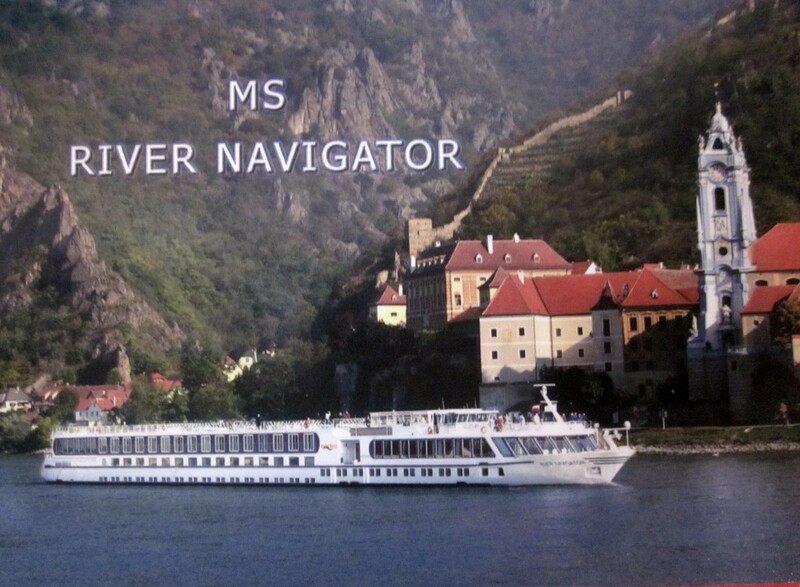 Here is a nice post card shot of our ship. Here we are underway. 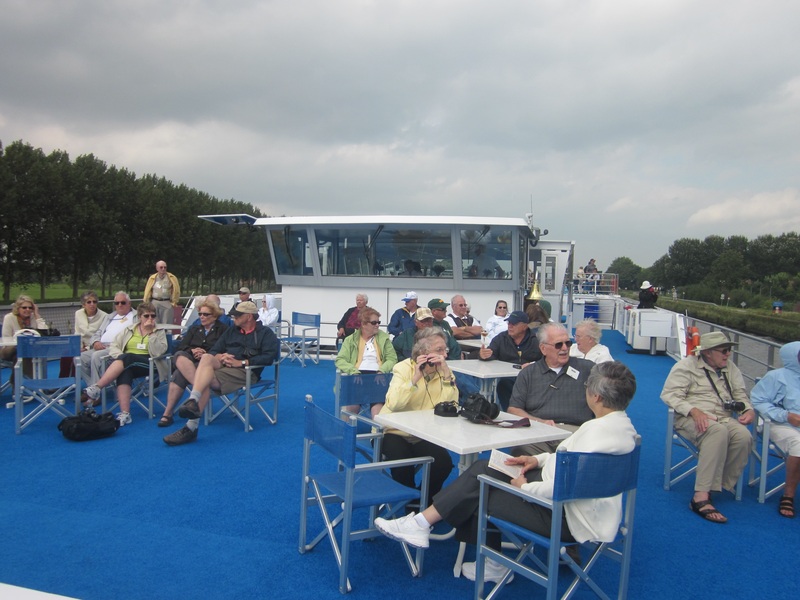 There was a nice sitting area on the top deck where we could watch the canal traffic. On the sun deck looking aft was the pilot house. This was a neat structure: It could be lowered to the point where the pilot house windows we even with the sun deck. 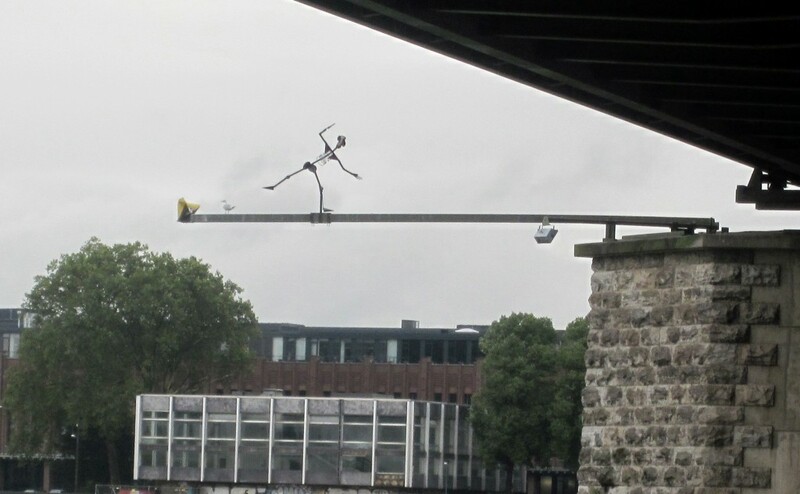 This had to be done several times to be able to pass under low bridges. 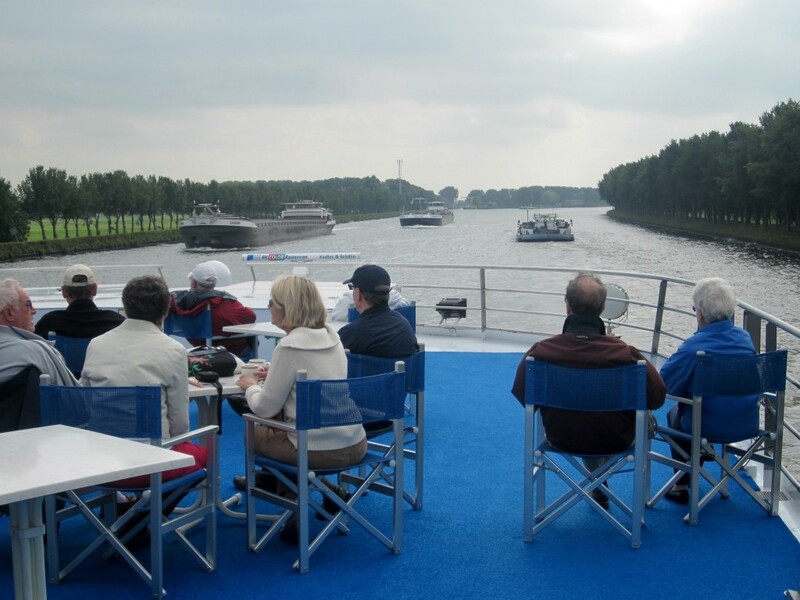 We cruised down the canal in the afternoon and enjoyed the “Captains Welcome Dinner”. The entree was “Pink Roasted Veal Loin on Sun Dried Tomato Sauce , Basil Risotto, and Seasoned Vegetables”. 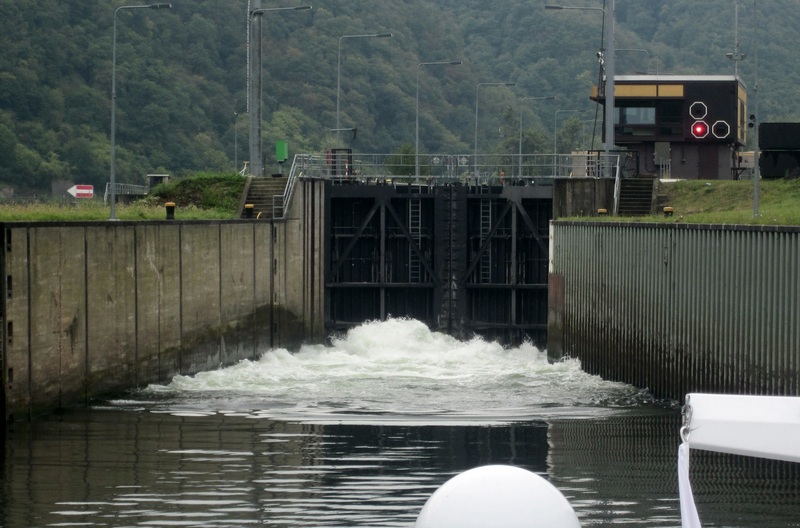 Sometime during the night we left the canal and entered the Rhine River. 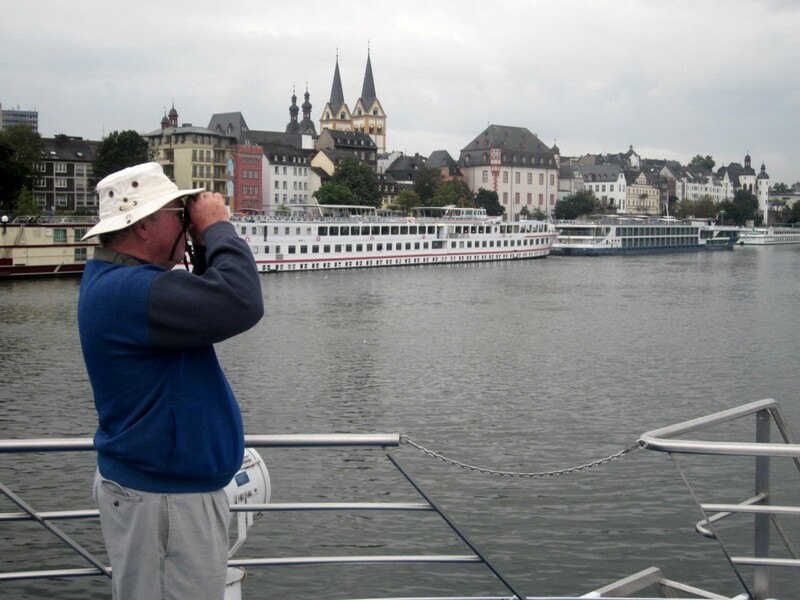 Our first stop on Day 3 was Cologne (Koln). 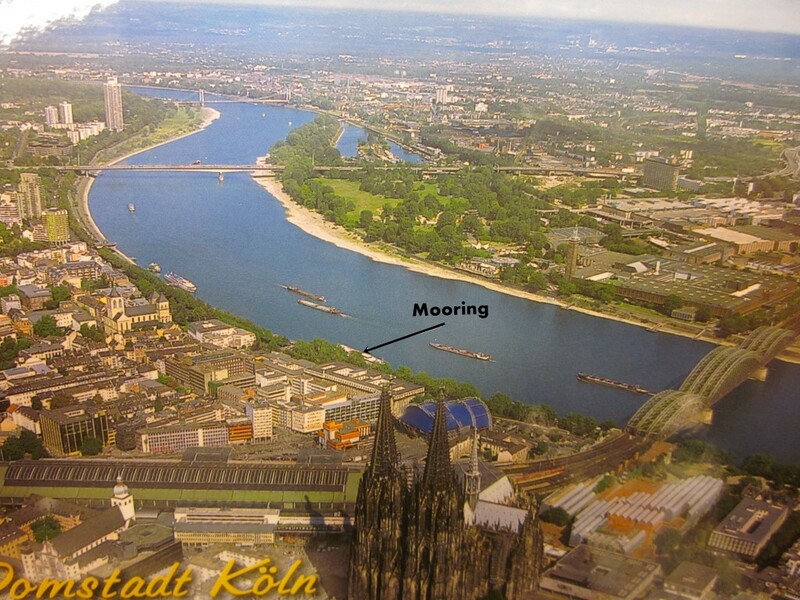 Here is an aerial view (post card) of Cologne. As you can see, the most outstanding landmark is the Cathedral. This is what the Cathedral looks like now. This is what it looked like in 1945. 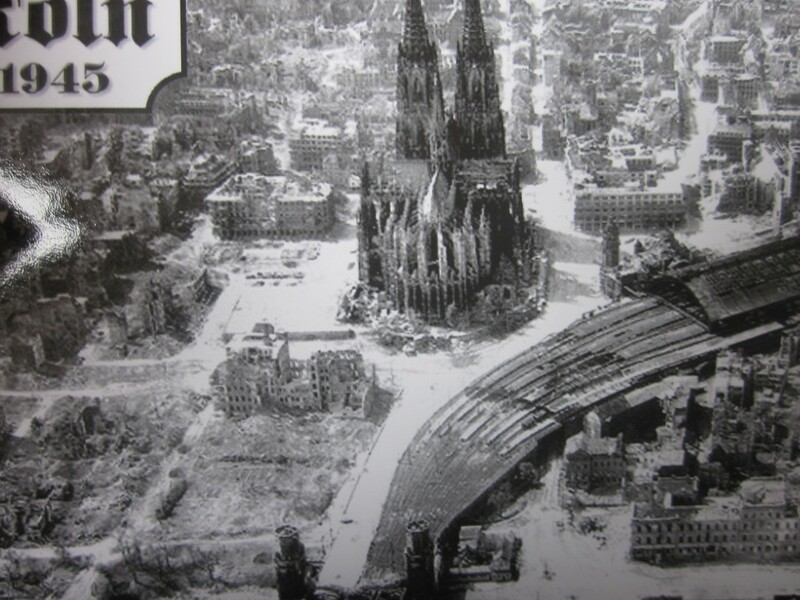 It was almost untouched by Allied bombing. You can see the destruction around the Cathedral. All signs of the damage are gone and new building have been built. 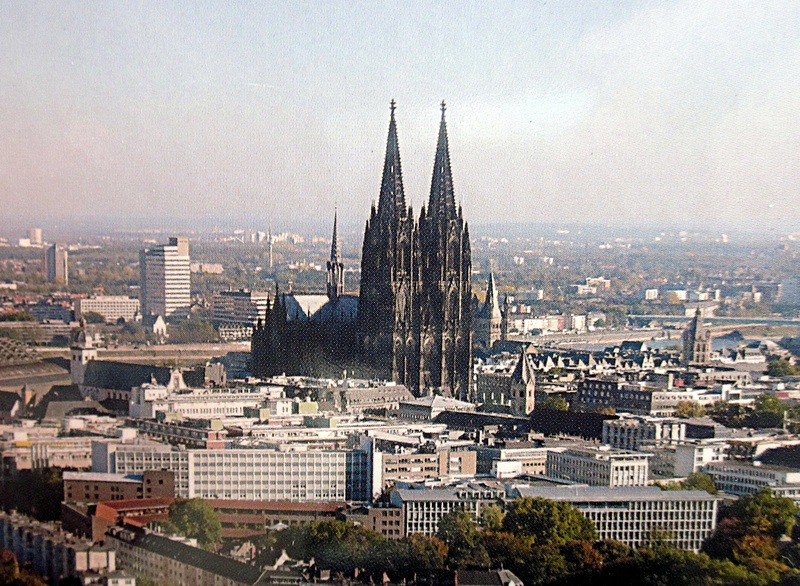 The German city of Cologne was bombed in 262 separate air raids by the Allies during World War II. It was expected that the devastation from such raids might be enough to knock Germany out of the war or at least severely damage German morale.The number reported killed was between 469 and 486, of whom 411 were civilians and 58 military. 5,027 people were listed as injured and 45,132 as “bombed out. Quite a mess! 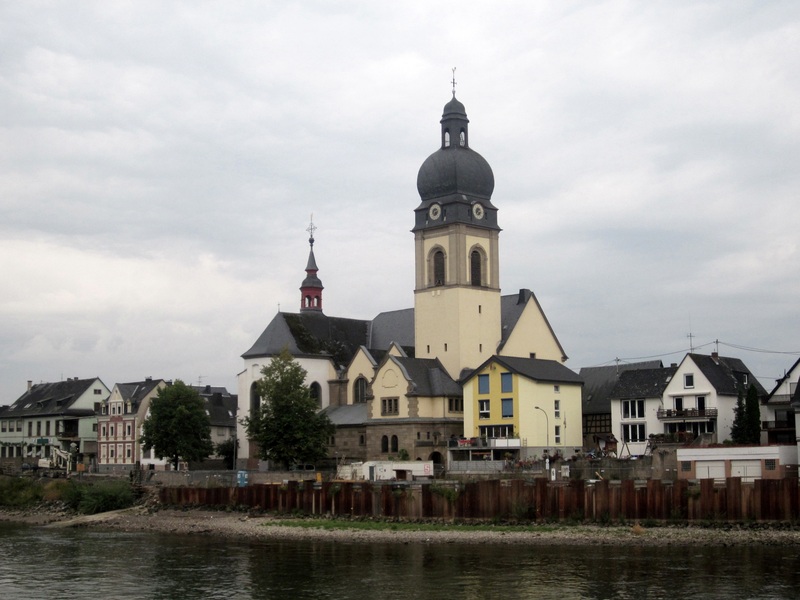 The name of the Cathedral is the High Cathedral of St. Peter. Here is a picture of the interior. Construction began in 1248 and was halted in 1473, leaving it unfinished. Work restarted in the 19th century and was completed, to the original plan, in 1880. It is 474 ft long, 284 ft wide and its towers are approximately 515 ft tall. 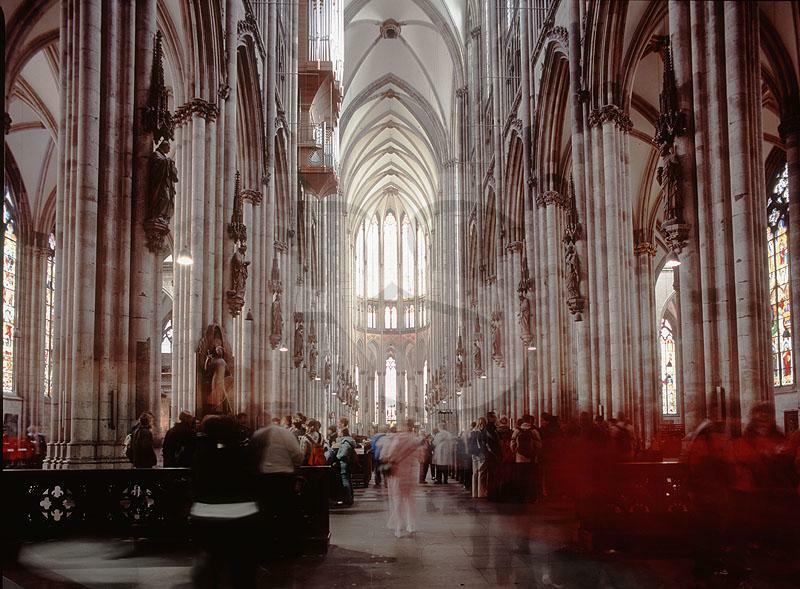 The Cathedral is the largest Gothic church in Northern Europe and has the second-tallest spires and largest facade of any church in the world. The choir has the largest height to width ratio, 3.6:1, of any medieval church. 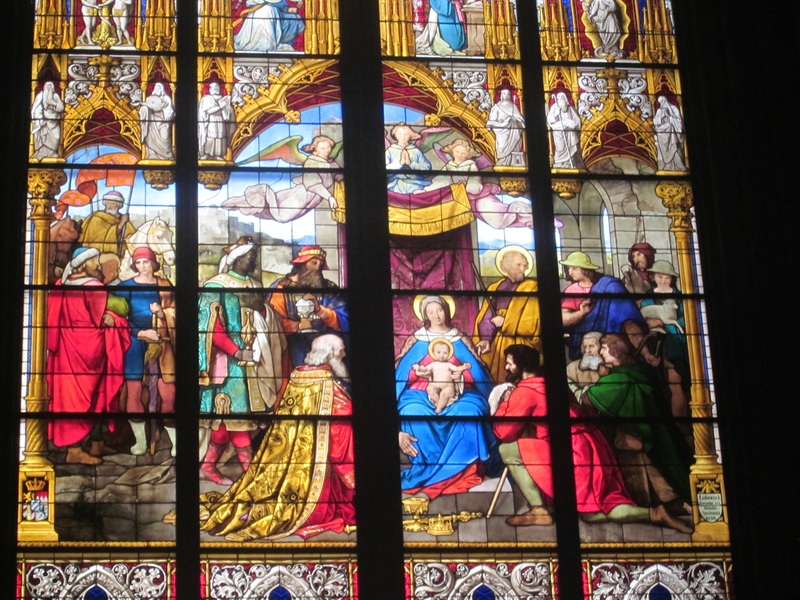 This is a detailed look at “The Adoration of the Shepherds and Kings” stained glass window in the Cathedral made by the Munich Workshop in 1842 Note that all three of the Magi are present. 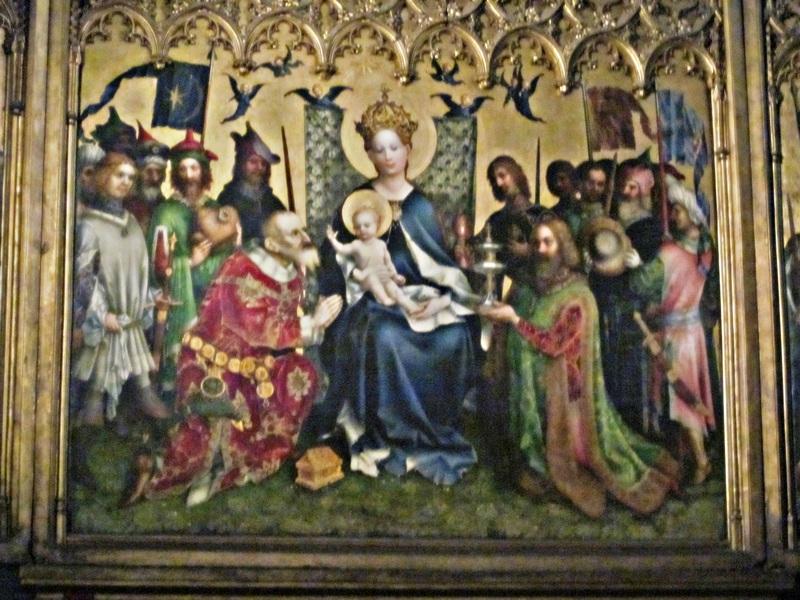 This is the reliquary in the Cathedral that is supposed to contain the bones of the Three Wise Men or “Magi”. 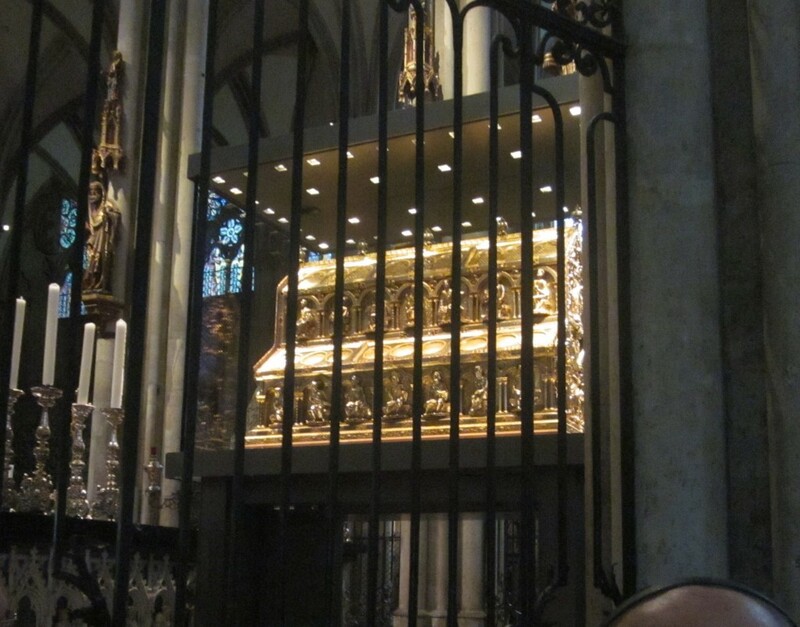 The shrine is a large gilded and decorated triple sarcophagus placed above and behind the high altar of Cologne Cathedral. It is considered the high point of Romanesque art and the largest reliquary in the western world. If the black guy “hadn’t been invented” who is in the box? 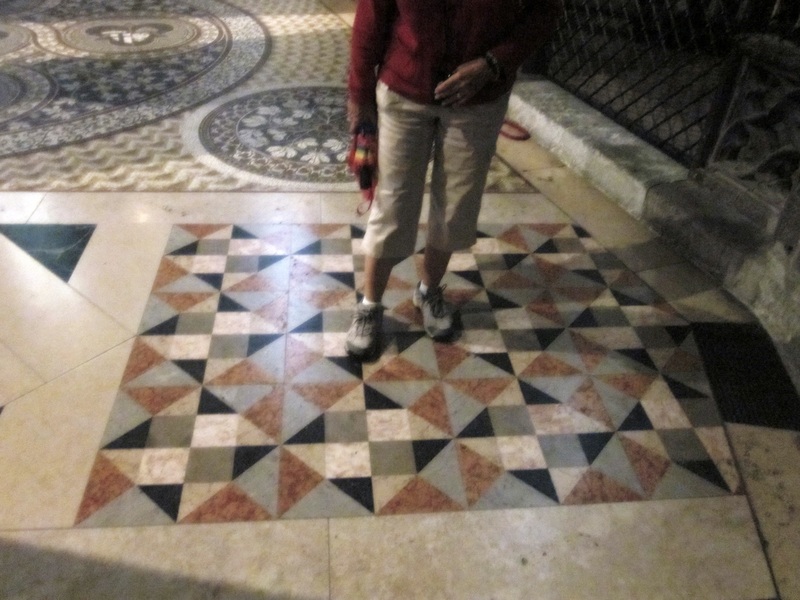 One thing we both thought was quite interesting was the Cathedral floor tiles. Many looked exactly like quilt designs that Mary Ann had made. This is one of them. It’s called an “Amish Pinwheel” according to Mary Ann. Ehrenbreitstein Fortress is a fortress on the mountain of the same name on the east bank of the Rhine opposite the town of Koblenz in the German state of Rhineland-Palatinate. The fortress was built as the backbone of the regional fortification system by Prussians between 1817 and 1832 and guarded the middle Rhine region, an area that had been invaded by French troops repeatedly before. The fortress was never attacked. 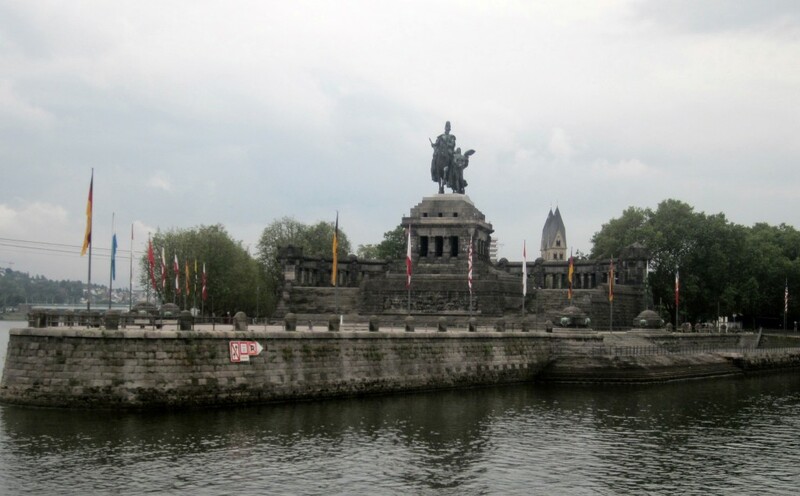 On the point where the Moselle Rive enters the Rhine River at Koblentz stands the Monument to Emperor Wilhelm I was erected right below the Fortress, but on the west side of the Rhine.. Both fortress and monument were considered as symbols for the “Guard at the Rhine”, as in the song “Die Wacht am Rhein“. 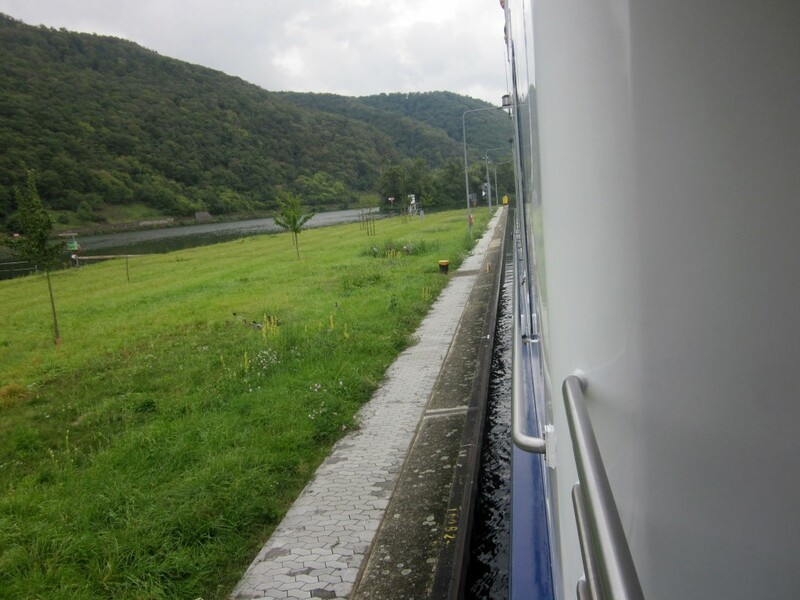 We entered the Moselle River here. I had to keep an eye on things to be sure we made it past Koblentz. Upstream on the Moselle from Koblentz, we passed the remains an ancient (2000 year old) Roman built bridge. 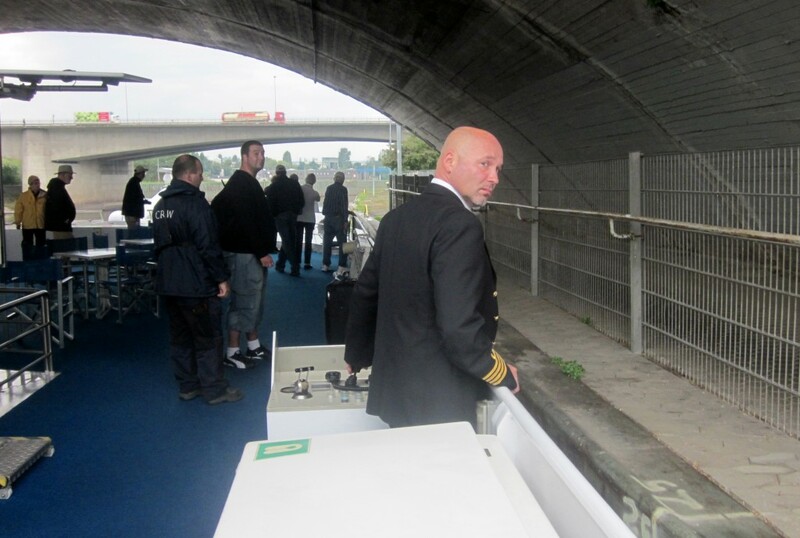 Our Captain: Lazlo Frey guided us expertly under this bridge from his control station on the starboard side of the ship. 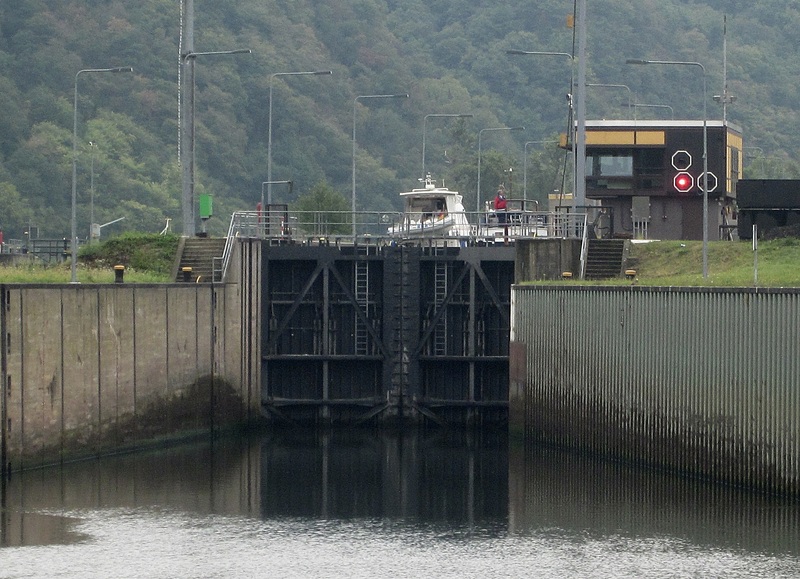 Roman troops commanded by Julius Caesar reached the Rhine and built a bridge near here between Koblenz and Andernach. 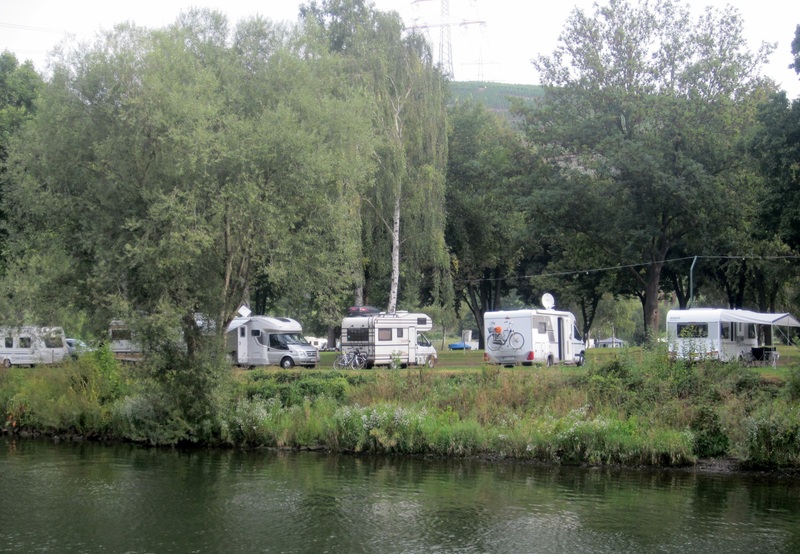 We passed many campground on the Moselle and Rhine. Most of the campers were small RV’s and most were quite new. Judging by the number of campground (mostly full) we saw, riverside camping is quite popular here. This is the Hochmoselbrücke (High Bridge) across the Moselle near Urzig. It is 519 feet high. Note the vineyard on the hilside. 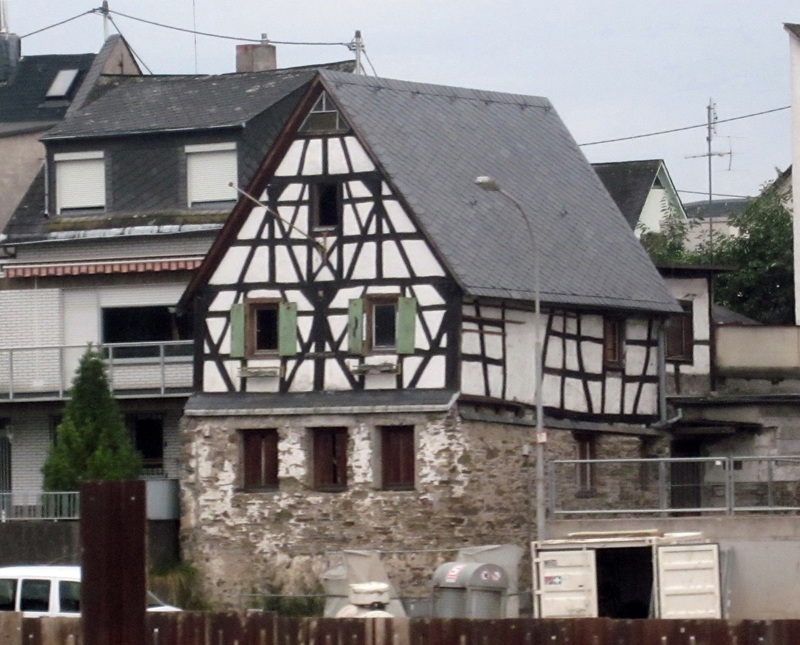 Opposition to the building project was based on questions of its economical necessity and the negative ecological impact on the Moselle wine region. 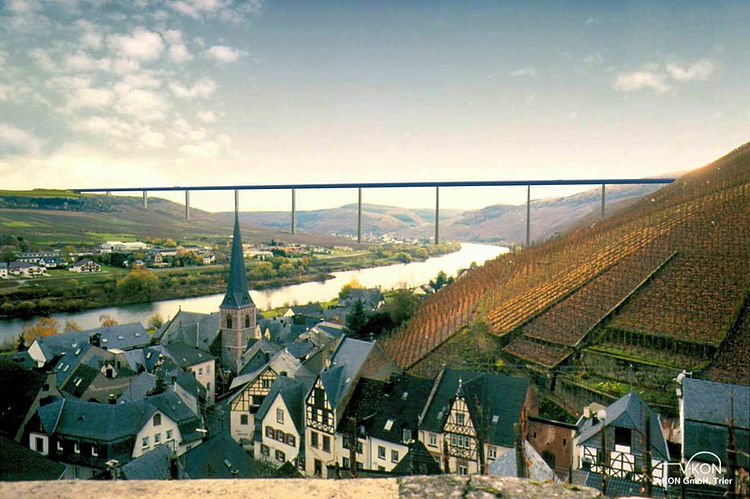 More importantly, perhaps, is the concern that the “ungainly” bridge would destroy a historical cultural section of major significance within the Moselle wine region. The section is home to some of the finest and most historical vineyards of Germany. 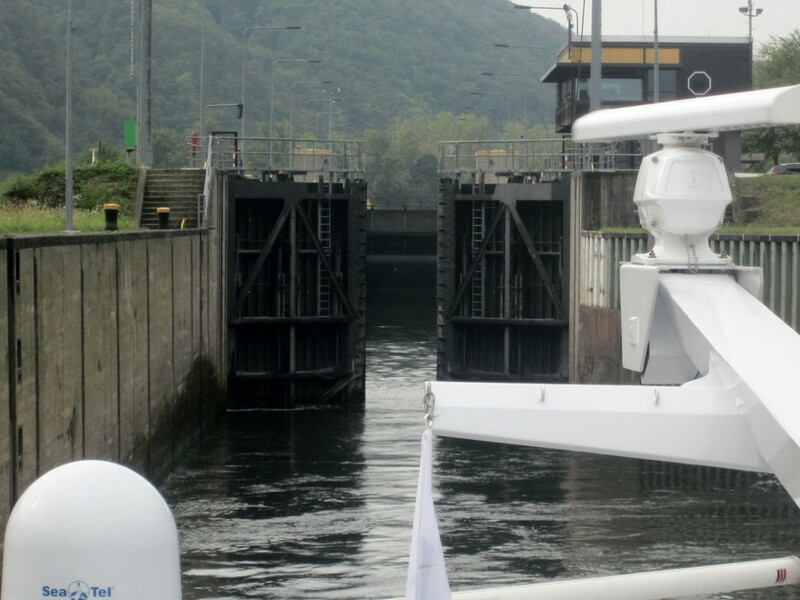 Below are four pictures of one of the 38 locks we passed through (some twice) as we went up and down the Moselle and up the Rhine. Tight squeeze! 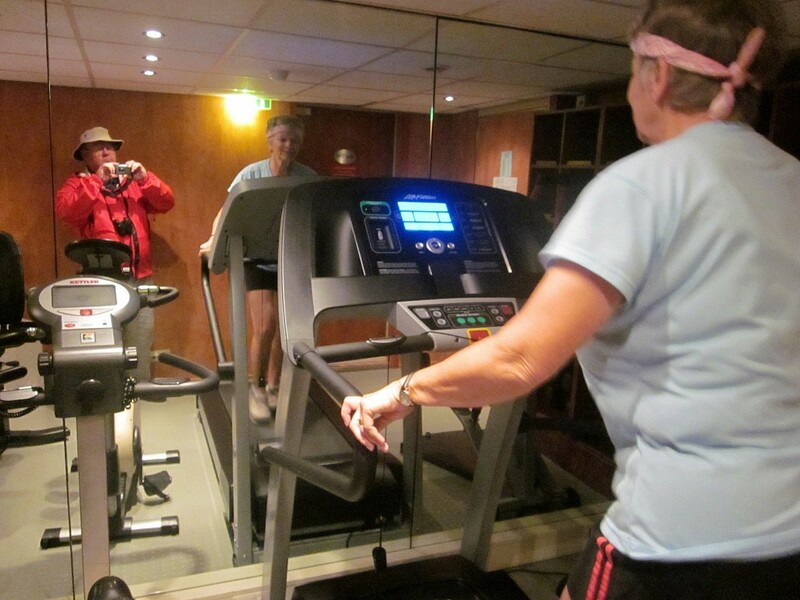 While we were passing through the lock, Mary Ann was on one of her many visits to the ship’s fitness center working off some of her excellent breakfast. I stayed on deck to look at the scenery.